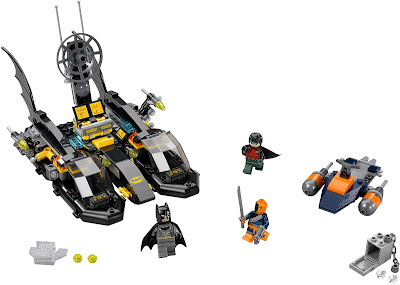 Back with a another geek-interest LEGO set, this time we're taking to the waves with the Caped Crusader. It's a been a couple of years since we last reviewed a DC Comics set, but we're happy to say that we're back in black. We clip on our utility belts and get building Batboat Harbour Pursuit #76034. The main part of the build is the Batboat itself, but you also get a neat little jetski for the bad guy, Deathstroke. Included also is one of those new jumping transparant parts (which we've seen before in the Hulkbuster set) which allows you to flick your minfigs around. More on that later. Altogther, at a very leisurely pace, it took us about 45 minutes to complete, or rather two episodes of Community on Netflix (which is usually how we time LEGO builds - you have to have something on in the background, right?). L to R we have Deathstroke, Batman, and Robin. Deathstroke is a brand new fig and this is his first appearance, no doubt incresinging the desirability of the set to collectors. We've seen this version of Batman before, but here he, and the Boy Wonder, have the new soft-feel material cloaks which we definitely prefer. Robin has also been seen before, but this minifigure has some new printing on the torso. All in all, these are three good minifigures, both in terms of play and to add to your collection. ...diamonds! Damn these criminals - always stealing from the wealthy. No wonder Bruce Wayne went nuts and started dressing up as a bat. On to the Batboat itself. The whole thing sits on four small dingy pieces, which here are coloured, as you might expect, black. Apart from that solid base, the top of the craft seems a bit messy, with different coloured parts all seemingly thrown on top of each other. ...and also feature their own little stud shooting gun. There's a sticker panel in each, and they look really quite nice. While Robin ventures out alone, Batman can flip up that central dish piece to reveal a work station. Complete with chair, there are two keyboard panels and a few stickers to make up screens. This makes the remaining Batboat a kind of base, we guess. And that base certainly isn't unarmed, as on either side there are flick-fire missiles ready to launch. These sit on a pivot joint which is actually very satisfying to move around thanks to having just the right amount of tension. ...the whole thing tips up, catapulting whoever is in the chair up and into the water of the harbour. Its a nice game element similar to what was built into the Hulkbuster set. Best to keep the work station closed up then, eh? That's better. You get him, boys! LEGO Super Heroes Batboat Harbour Pursuit #76034 is a great set and certainly feels worth the money. Although our perception of building LEGO has been warped slightly in the wake of the Kwik-E-Mart, it is a super-easy thing to assemble and has plenty of play scope for the wee ones. We also especially love the minifigures, as every LEGO fan needs a Batman! "That Deathstroke is a total jerk." "I know, right? More coffee?"